1. Place the butter, flour, cocoa powder, icing sugar and the zest of 1 orange into a food processor, and pulse until the ingredients resemble fine breadcrumbs. If you don’t have a food processor, you can rub the butter into the dry ingredients by hand. 2. Add the egg yolk and the juice of 1 orange, and tip the ingredients onto a clean surface. With light hands work everything into a rough ball – there should be enough liquid, but if not, add a little water. 3. Lightly flour your worktop. Reserve ⅓ of the pastry for the lids. Roll out the remaining ⅔ to the thickness of a pound coin. Use a 9cm straight-sided cutter to cut out 10 circles, and use them to line 10 holes of a non-stick muffin tray. 4. Tip the jar of mincemeat into a bowl and add the ground almonds, slug of whisky, grated chocolate and half the juice of the second orange. Mix all the ingredients together until well combined, then equally divide the mixture between the 10 cases. 5. Roll out the remaining pastry, and this time using a fluted 7cm cutter cut out 10 lids for the mince pies. Pop the lids on and place the muffin tray in the fridge to cool for 20 minutes. 6. Preheat your oven to 170°C, gas mark 3. Bake the mince pies for 20-25 minutes, then take them out of the oven and leave to cool in the tin. 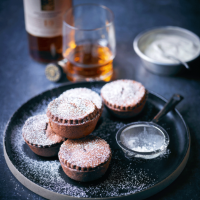 When cool carefully remove and dust with a flourish of icing sugar before serving with a dollop of whipped cream.